LIST OF TOP 20 MOST VISITED WEBSITES IN NIGERIA AND TOP BLOG SITES WITH THEIR POSITION AND RANKING ACCORDING TO ALEXA, GLOBAL WEB STATISTICS COMPANY. Many people especially advertisers use Alexa ranking to determine the most visited websites, it is good to based your judgment on alexa but you must bear in mind that alexa is no hundred percent accurate, because if websites A does signup with alexa and install their tracking code and website B that actually get more visitors and more pages did not signup with alexa, because alexa is not tracking the activity on website B website A will be considered the most visited. 12. JUMIA 13. GT BANK 14. DAILY POST 15. JAMB etc. 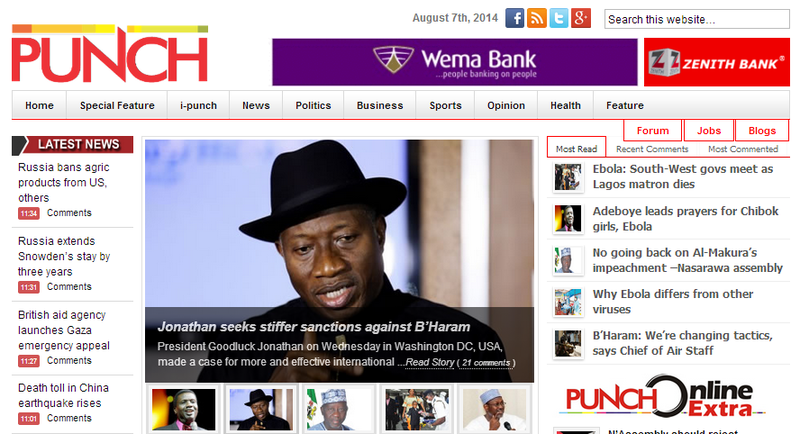 The naij portal is a news platform where most Nigerians go in search of happenings. Though Naij is a site which provides a variety of news, but it yet gives update on the entertainment beat as, music, games, jokes, etc and other desks; weather, job, business, health, etc. It is the most visited sites by Nigerians. Linda ikeji is a social media site, where gossips are shared. It has various categories of trends, entertainment, news, etc. It is also mostly visited by most Nigerians, because of the speed at which news are updated on the site. The Online version of the Vanguard Nigerian daily newspaper covers general national news on politics, business, sports, entertainment, etc. organisations and businesses go in search of Advert space and placement on this platform. Nairaland is a broad discussion forum for Nigerians. They Covers dozens of topic which includes science and technology, romance, politics, entertainment, news and lots more. This is one of the mostly Read Nigerian Newspapers. Daily Newspapers, Letters, articles, Opinions, news stories, etc is what is contained in the punch. molst businesses and organisations always bok advert space and time on this platform. It is an online newspaper. Naijaloaded is Nigeria's most popular information portal which loads individuals, groups, and regular viewers with Latest updates on News, Musics, jokes and all kinds of Video. Konga is Nigeria's Largest Online Mall. With over 100,000 products at great amazing price and exceptional service experiences to customers.Konga has various viewers who visits its site on a daily basis and this attracts more partronage to them. The Alternative advert platform is an online advert agency. They help organisations, groups and individuals reach over 50 million people online with advert trends and promotional services. Alternative advert has won two African awards in 2017 for creativty and effectiveness. The Worship Culture Radio though started lately, but is a fast growing platform for internet radio. The platform features gospel artistes and musics, gospel teachings and trends, gospel interactions, testimonies, interviews etc. they also stream live on facebook at most radio broadcast. It is a worldwide radio. Bet9ja is Nigeria's number one betting website. They allow people predict football games of which the winners are awarded with cash prizes. Bet9ja offers reliable, secure deposit and payment methods while they guaratee you payments of all winning bets. On this platform, the integration of sophisticated livescore and statistic widgets makes checking the bet process, less troublesome. This is an online betting site for sport events. They predict goal matches and reward people with good bet skills, in cash. Jumia is the number one Online Shopping site in Nigeria. They are online stores where people purchase all electronics, as books, home appliances, kiddies items, fashion items for men, women, and children; cool gadgets, computers, groceries, automobile parts, and lots more. it is an online platform through which demands could be brought on delivery to your door step. Guaranty Trust Bank plc is a leading African Bank that offers Online/Internet Banking, Retail Banking, Corporate Banking, Investment Banking ad Asset Management services. DailyPost Nigeria is an online platform that brings you the latest news on Politics, Entertainment, Sports & Opinions. it is one of the most visited website in Nigeria and this for its consistency in unleashing up to date information. The JAMB portal is a website for students who are in the process of moving into the higher institution. this portal is used for the Exam Online Registration, letter from JAMB for admission, etc. It is visited by anticipating students who want to further into the university. Information Nigeria is a news website in Nigeria that helps give trending information online. It visited by Nigerians who are engrossed with trends. it gives both national and international news on health, sports, gossips, entertainment, etc. Bellanaija is a Nigerian online magazine and blog that focuses mainly on Fashion. though it gives few trending reports on news, entertainment, fashion, lifestyle and other media contents aimed at pan-African and Nigerian audiences. Hot Nigerian job is a website basically for Nigerians who are in need of Job opportunities. on this platform, opportunities are shared and discussed. Is an online shopping mall, where fashionable products are bought and ordered for. products are ordered for on this platform at agreeable prices and placed on home delivery, according to client's bargain. Hottest gist is a news website where happenings are posted and shared. It is a site basically for news content and entertainment gists. it covers contents on health, politics, music, jokes, oppurtuinities, etc. The list of the most visited websites and top blogs in Nigeria is according to alexa , the list changes from time to time and the position change very often depending on the numbers of visits and page views in each of the websites.